I like to have quick and easy recipes on hand for those busy nights where you just don’t have the energy or the time to cook and you also don’t want to wait for delivery or go out to pick something up; this tasty cilantro lime skillet chicken is perfect for those nights! You literally just brown the chicken, make a simple butter, garlic, lime and cilantro pan sauce and you are good to go in less than 20 minutes! Make some rice or pasta and steam a vegetable and you have a complete, light and healthy meal in less time than it takes to have food delivered! 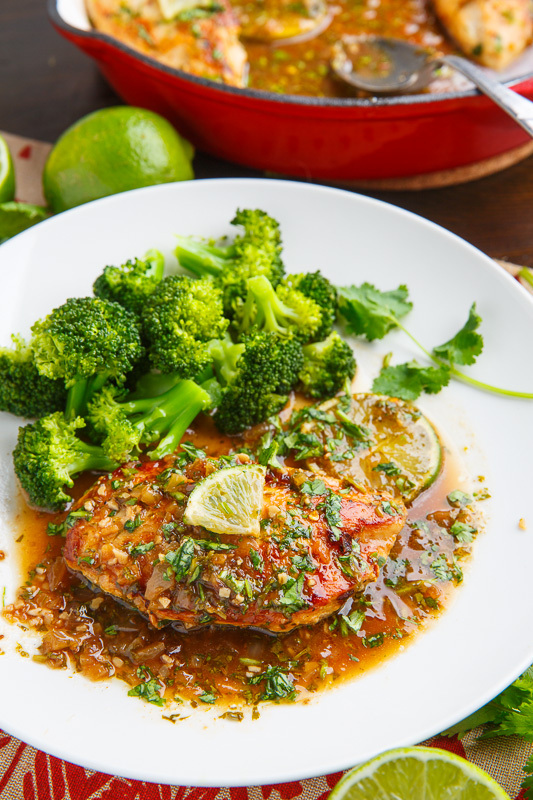 The sauce for this chicken is loosely based on the butter, lemon and garlic sauce similar to a shrimp scampi sauce except with lime and cilantro! Yum! Add the broth and deglaze the pan by scraping up any brown bits from the bottom with a wooden spoon while the broth sizzles. Add lime juice and zest and season with salt and pepper to taste before removing from the heat and adding the cilantro and chicken.